SportCrafters announces its new integrated progressive resistance system that provides a non-linear power profile that provides realistic power versus speed. The new patent-pending roller drum uses magnets in a uniquely dynamic application. All heat produced is quickly and effectively dissipated through the large spinning surface of the roller drum so the drum never gets hot. There is no friction, no fluid, no fans, no noise, nothing to wear out, and the entire device adds less than a pound to the weight of a roller. It's all inside the roller drum, so it is inherently robust with no add-ons. the progressive resistance feature, allowing an easier spin at high RPM's. 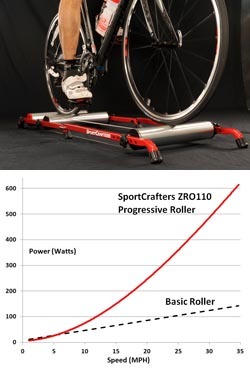 The progressive resistance roller drum can be installed on any SportCrafters, CycleOps bi-fold, and older Nashbar bi-fold rollers made by SportCrafters. It is available now at approved retailers listed on SportCrafters.com.